Established in 1988, Shoma Group is an award-winning real estate development company specializing in residential and commercial projects. The developer of CityPlace Doral and Oasis Park Square, Shoma Group has been the driving force behind the evolution of Doral from a once industrial hub to now a thriving, vibrant city. Over the past 27 years, Shoma Group has developed more than 10,000 homes and condominiums including the prestigious Doral View, Anastasia, Las Ramblas, The Manor and Park Square and has 10 projects in the works including Contempo in Doral, The Collection Residences, Santander and 1500 in Coral Gables and luxury townhomes in Miami Beach. 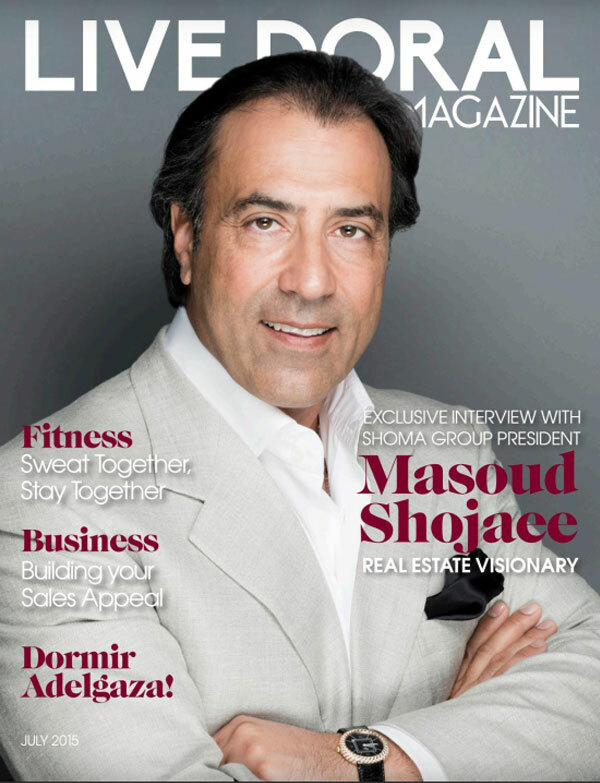 Led by President and Chairman of the Board, Masoud Shojaee, Shoma Group has built a reputation as one of South Florida’s most trusted developers and is known for developing the best products in prime locations. Live Doral Magazine caught up with Shojaee for an exclusive interview in his office in the heart of Doral. Naturally, he developed the entire class-A building. MS – CityPlace Doral is an $800 million, 55-acre mixed-use project that include more than 1,200 luxury condos, apartments and single-family homes with 350,000 square feet of retail space. We have some exciting dining and entertainment options coming to CityPlace including Burger & Beer Joint, Sushi Siam, Salsa Fiesta, Cooper’s Hawk, Cabo Flats, Pie Bar, CineBistro and Kings a 20,000-square-foot bowling alley. Premium grocer, Fresh Market, has also signed on as an anchor tenant. I am very excited about this transformative project and bringing these fine establishments to Doral. MS- Adjacent to CityPlace, Oasis Park Square is a gated community of 150 ultra-modern, two-story single-family homes. Its location is far superior than other new home developments in Doral as it is close to the heart of the action. We have many stand-out design features including expansive floor plans that allow for four and five bedrooms, rooftop terraces with Jacuzzis, European-style kitchens and bathroom fixtures and walk-in wine cellars. Oasis Park Square has been very popular with buyers from around the world and it is true that we are almost sold out. In my many years of developing, I can speak from experience when I say that quality is always recognized by the most discerning buyers and when they come to our sales gallery after viewing others, it is clear that Oasis Park Square is of the highest quality. MS- The citizens of Doral are arguably the best part about this growing city. We are a very young city, with a tight-knit community and we are working hard to make sure we set eh foundations now for a long and prosperous future. We have everything a family could want with our sprawling parklands and Doral is conveniently located just a short drive from the international airport, downtown, Brickell and Miami Beach. We have great attractions and fine hotels including the luxurious Trump National Doral and the Intercontinental at Doral. And best of all, the Doral community is one in which a newcomer will find it easy to make friends and feel very welcome. It has long had a reputation as a place where many Latin American families choose to reside when they come to Miami and has strong Venezuelan, Brazilian, Colombian and Argentinian influences. MS – Shoma will again be elevating luxurious living in Doral with a new project we will soon be launching. While we are still in the early planning stages, the project will feature 255 luxury condos and 30,000 square feet of retail. The Future of Doral is bright and this new project will be another wonderful component of our great city.